Here's an assignment I did for my experimental type class. 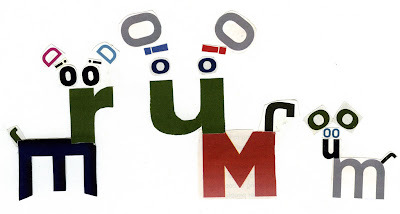 I had to make this out of random cut out letters found in magazines or books. I think it's some sort of deer family or something, you decide. It made me take a closer look at certain letter forms which was quite intriguing. Fun, fun, oh and did I mention fun. I think I like the color one better, I think it has a little more character ... I need to sleep.